2000 AD DOUBLES THE DREDD! To commemorate the explosive double-length final episode of Dredd/Aliens: Incubus, in Prog 1335, which hits the streets on April 9, 2000 AD will be published that week under two separate Dredd/Aliens covers. The covers, both of which are drawn and inked by one of the most definitive Dredd artists of recent times, Jock (Lenny Zero, Hellblazer), and coloured by legendary colourist Chris Blythe, feature the lawman of the future facing off against the biomechanical terrors as they attempt to infest Mega-City One. The variant-covered editions will be produced in an equal 50:50 ratio, and both should be available from any good newsagent or comics retailer. In recognition of the loyalty of our subscribers, all readers with a sub to 2000 AD will receive both versions of that week's edition, rather than the regular single copy. 2000 AD editor Matt Smith said: "When Jock supplied us with two great cover images to choose from, we couldn't decide between them. So why deny the faithful Squaxx dek Thargo of seeing one when they can have both? 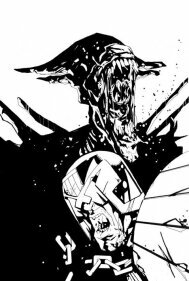 This special variant cover event marks the end of the hugely successful Dredd/Aliens crossover in style, as Incubus comes to its explosive, acid-frying climax!" Jock added, "I'm really pleased to be involved with this idea, especially as it came as a complete surprise to me! 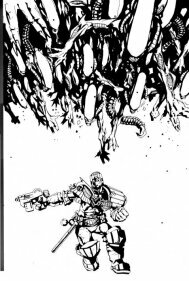 I had already produced the design with Dredd being attacked by a horde of Aliens when Matt Smith called to tell me my cover would be on the final part of the story. We both felt that a design featuring the Alien Queen would be more appropriate, so I worked up another image. I happened to put the older piece on the CD when I sent the artwork in - just to show Matt - and he quickly called me to say they'd be using both! It was great news." In addition to the finale of the Dredd/Aliens story, Prog 1335 will feature the final episode of the current V.C.s series, as Major Smith and his hard-bitten battle unit take the fight to the Geek fanatics, and the end of the second series of Atavar, as the UOS threat advances mercilessly across the galaxy. The end of these three major series leaves the way open for 2000 AD's Spring Attack, which starts in Prog 1336 (streetdate: April 16) with all new stories including the trial of Soviet Assassin Orlok in Judge Dredd, brand new counter-terrorist series Snow/Tiger, and the return of the ABC Warriors.